Outdoor Shower - Why Not? 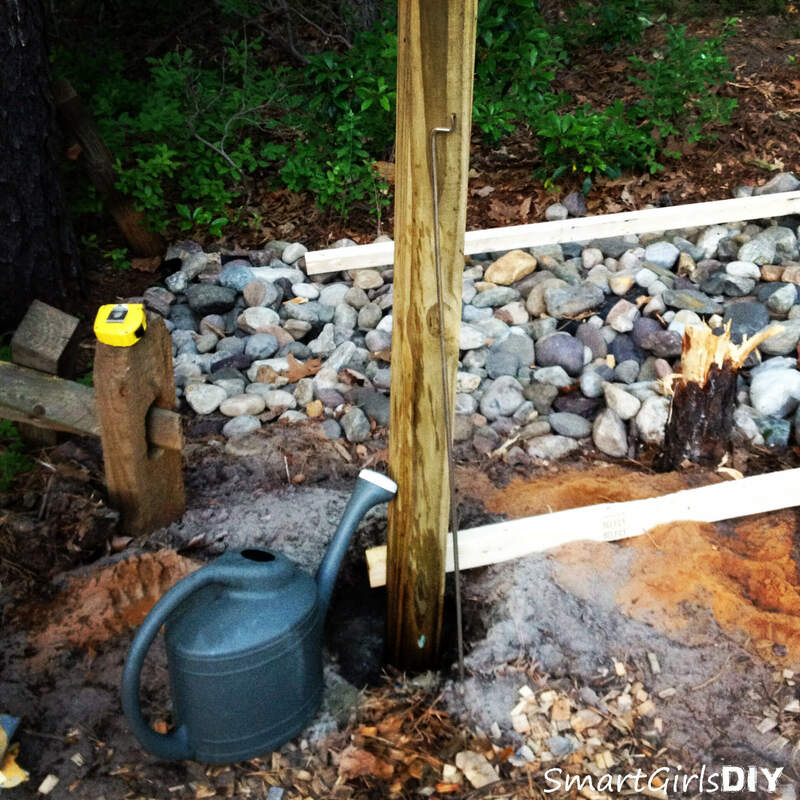 You are here: Home / Outdoor Projects / Outdoor Shower – Why Not? 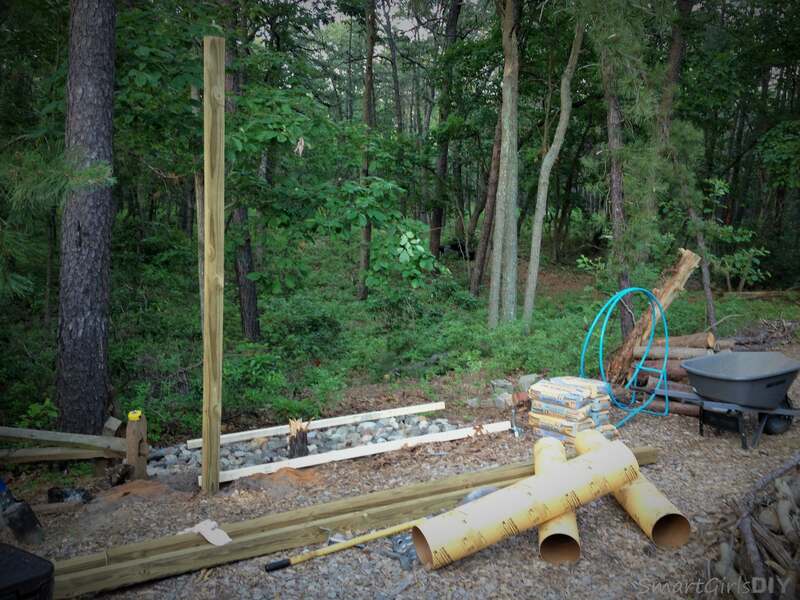 Yes I have a ton of unfinished projects around my house (family room, office, hallway, bedrooms) but that doesn’t mean I shouldn’t start building an outdoor shower, right? It’s actually been on the to-do list pretty much since we moved in 5 years ago. But, wouldn’t you know, it hasn’t happened. 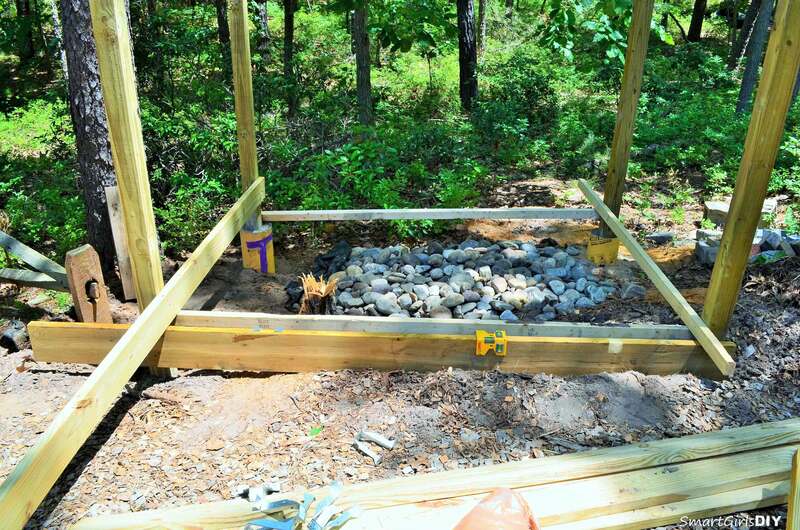 It almost happened a few years back… I marked out the spot, built a little step to get up to it, had hubby dig a giant hole, and buy a drywell. 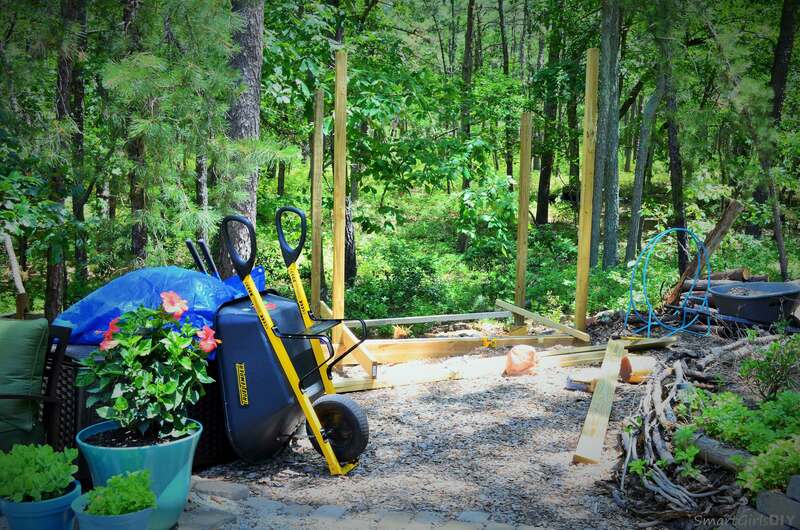 Lars (hubby) even set the concrete forms in an effort to move things along (my man likes himself a nice outdoor shower), but the forms were not laid out properly and last summer I gave up and had him fill in the giant hole. Ooops. I did make a little patio out of that area a few weeks ago, so it’s all good. 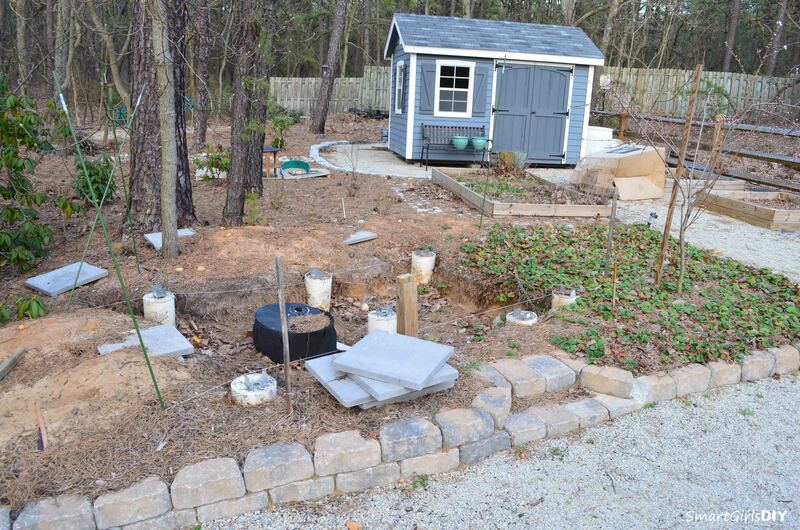 And we reused the drywell for another project too. The real reason we gave up on that shower was because I changed my mind about the location. It was uphill from our house and pretty exposed to the street. Don’t ask why I thought it was a good spot to begin with, just go with it. 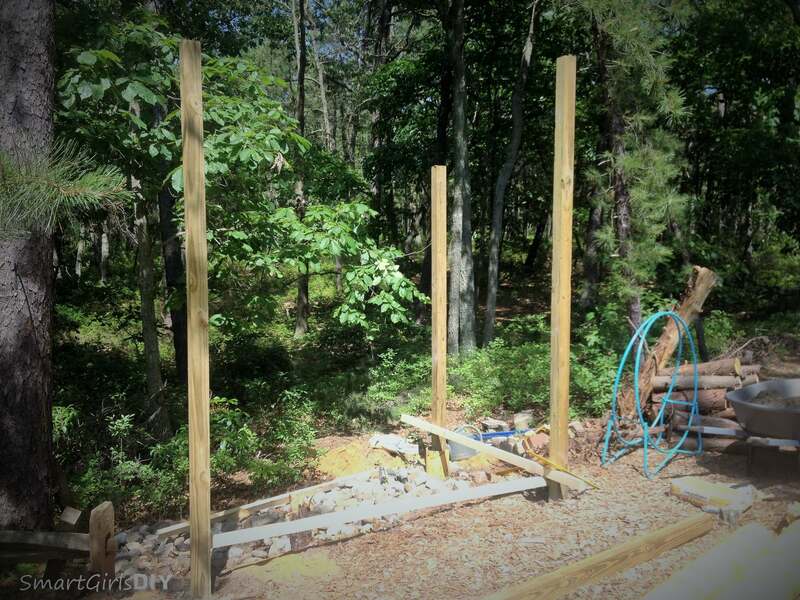 Anyway, I decided to make hubby his long-awaited outdoor shower for his birthday/Father’s Day. So I’m a little bit late, but it’s hard to find a hot second to work on it. Lars has been traveling a lot and for whatever reason he never leaves me with his pickup truck. It’s not a big truck by any means, but it sure is a lot easier to load lumber into. 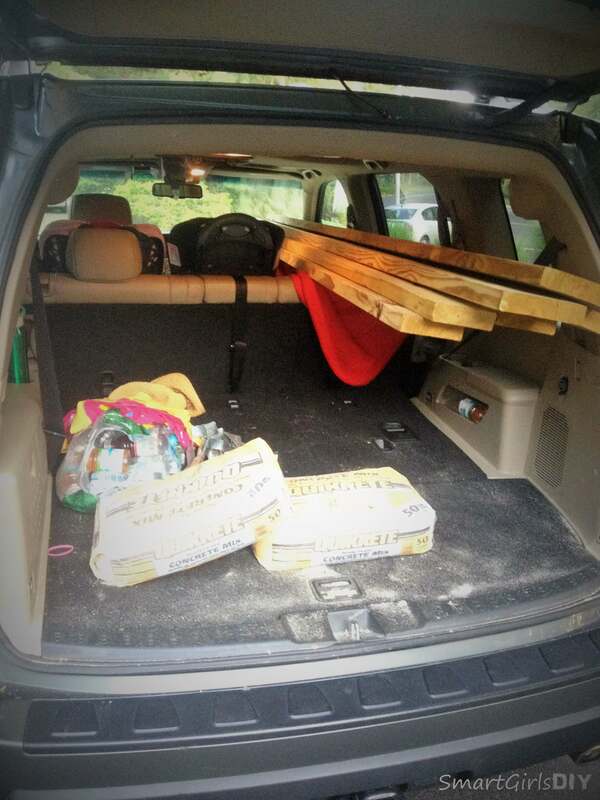 Whatever, I now know that I can fit 12′ 4x4s in my Honda Pilot. I bought 4 and had to make two trips home with them, but lucky for me Lowe’s is only 1 mile from my house. Crazy, right? I’ve walked there before with Smart Jr. The materials sat in my yard for about a week (except the Quikrete, that was safe in my garage) and then on Tuesday night I finally got to work. I still haven’t solidified a design in my head, but I do know how I want the decking to run, so I decided to just go for it and figure the rest out as I go along. For the sake of full disclosure, let me admit that I dug that first hole 3 times. Yeah, I kept changing my mind about where the showers should be located. So I dug, filled in, dug, filled in and finally dug the hole in the right spot. Yay! 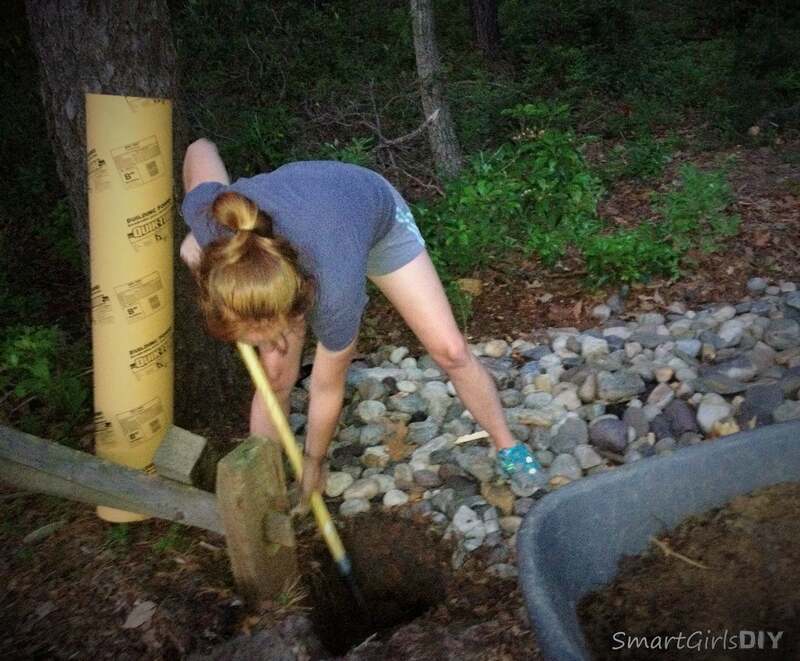 I also had to borrow a post hole digger from my DIY neighborhood friends because I left mine at my mom’s house. I had planned to use those cardboard concrete forms with metal attachments to connect the 4x4s, but I ended up going old school and just stuck the 4×4 right in the ground. Lars had set metal fittings in the concrete the last time and nothing lined up properly, so I’ll be returning what I bought. 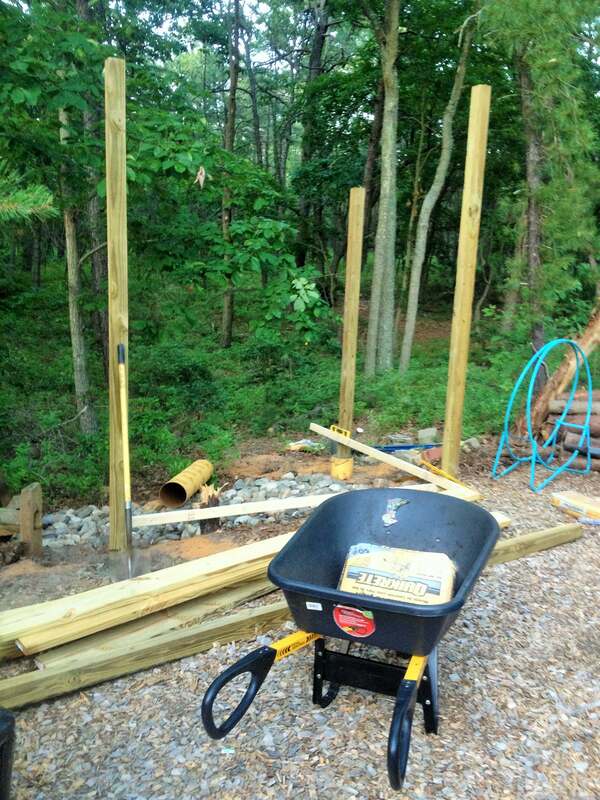 The hole is 36″ and I managed to lift the 12′ 4×4 in there by myself. I did call Smart Jr to hold it in place as I poured the Quikrete in the hole. I always buy the 50 lb bags if I’m working alone. Those 80 lb bags are just a little too heavy for me to lift and pour from. It took two 50 lb bags to fill the hole. 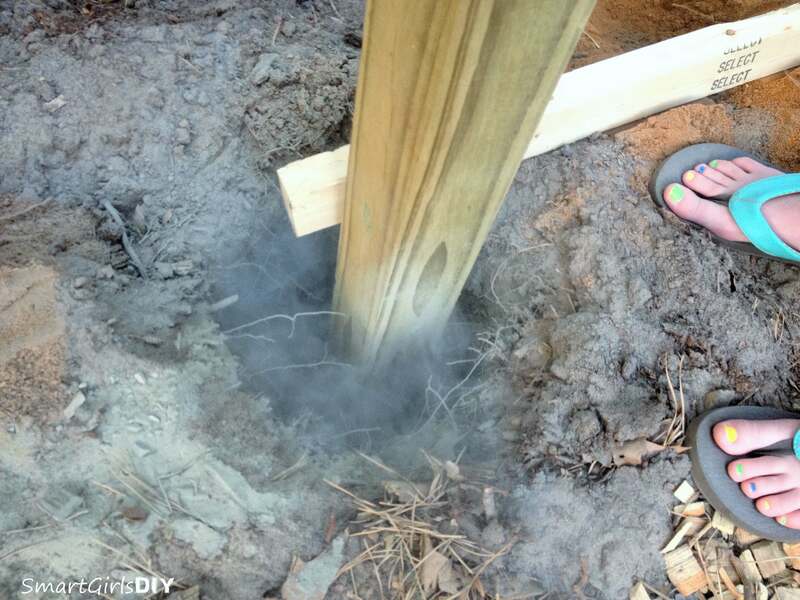 It looked like we were cooking up a potion when I poured the dry concrete mix in the hole. 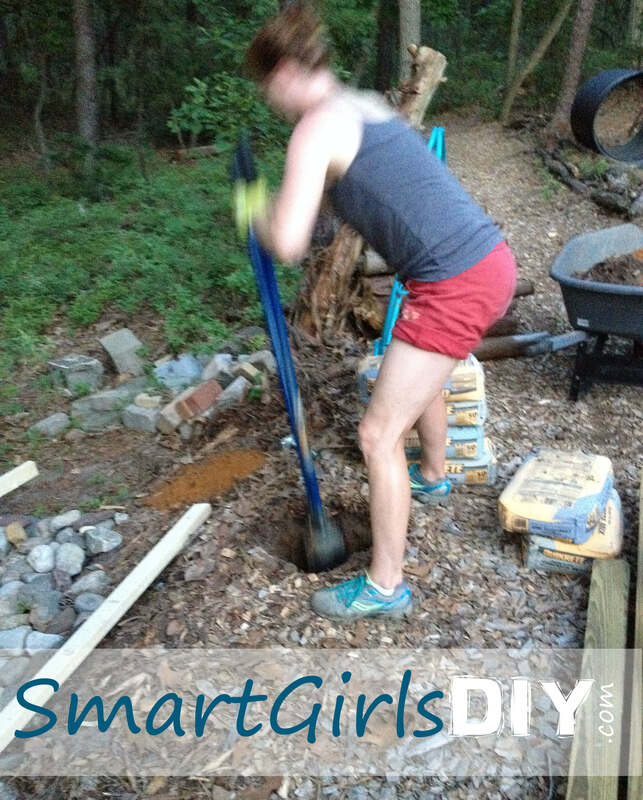 Then I added water from a watering can and mixed the concrete in the hole with a leftover metal rod from one of my kids’ cribs. Yeah, that’s how this chick rolls. I only dug the second hole once, lol. Then Smart Jr guided the post into the hole for me. I screwed a scrap 2×3 to the first post to help me line up the second post. After I checked to make sure the post was plum, I added the two bags of Quikrete. To clarify, I added gravel to the bottom of the hole before putting in the 4×4 and I water the hole between the two bags of concrete. 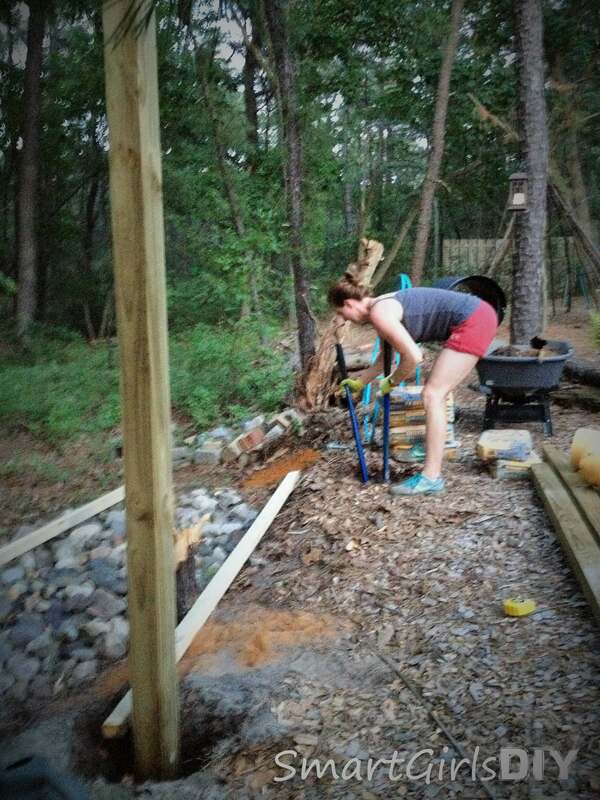 I also couldn’t dig down the full 3 feet, so I decided to extend the concrete form above ground even further. Well, don’t ask, but I had to take the post in and out to get it in exactly the right spot, and it was so much easier to move it without the concrete form. 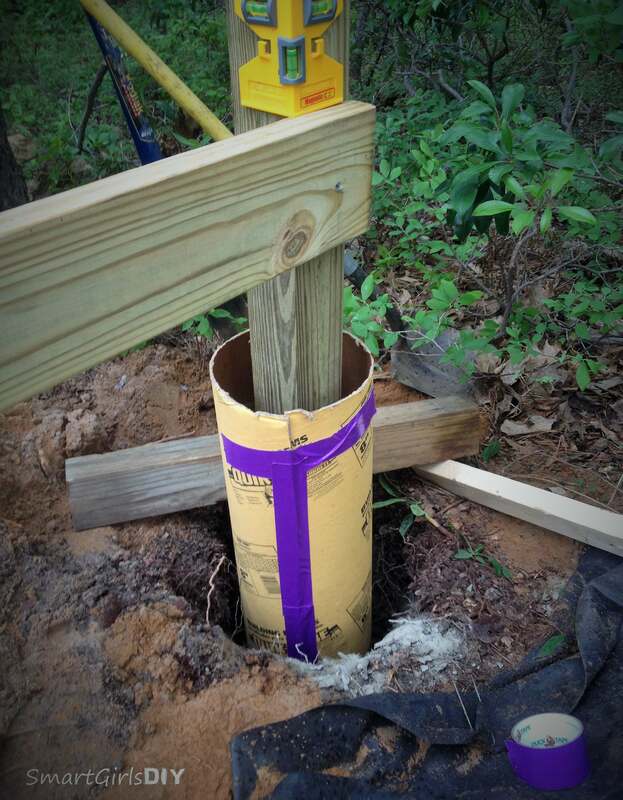 So I just poured the concrete in the hole like I did with the first two posts. Then I tried to jerryrig a form around the post. It worked so-so. 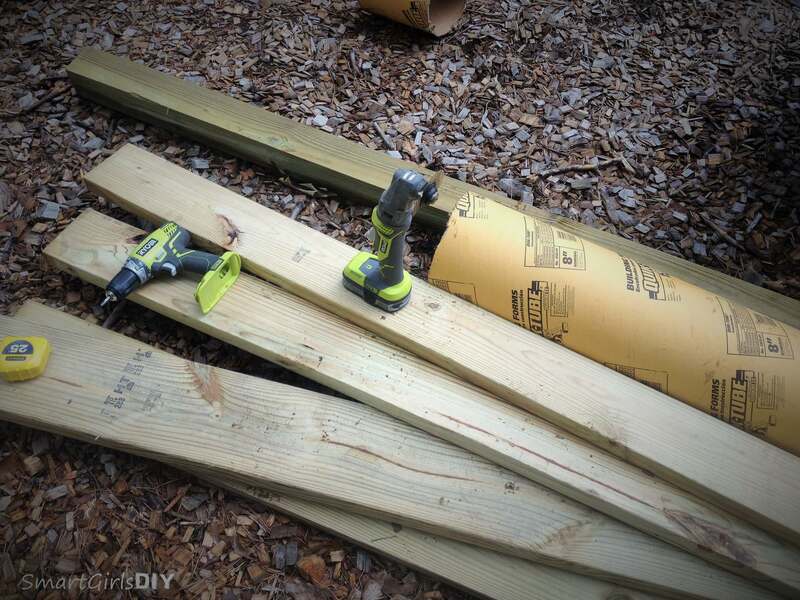 This time I trimmed the form with my Ryobi multi-tool. And here’s where I’m at now. I’m still trying to decide if I want to put up a partition between the shower area and the changing area, or just leave it open. What do you think? The shower measures 8’x6′. I can’t wait until it’s finished!! Week 15 – Garden Pics by Smart Jr.
Week 16 – Smart Girl What? You are a rockstar to tackle this on your own! 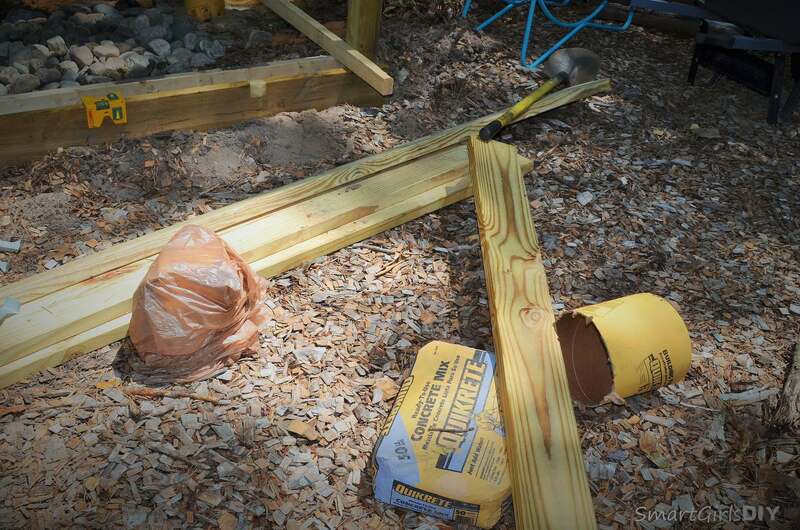 And I know the feeling of needing “just one more trip” to Lowes for concrete. Good luck, it’s going to be awesome! Thanks Hilary! I can’t wait to share the finished product! Woman, you wear me out. I would need an IV of coffee or Red Bull to keep up with you. lol Looking forward to seeing the shower when you are done. 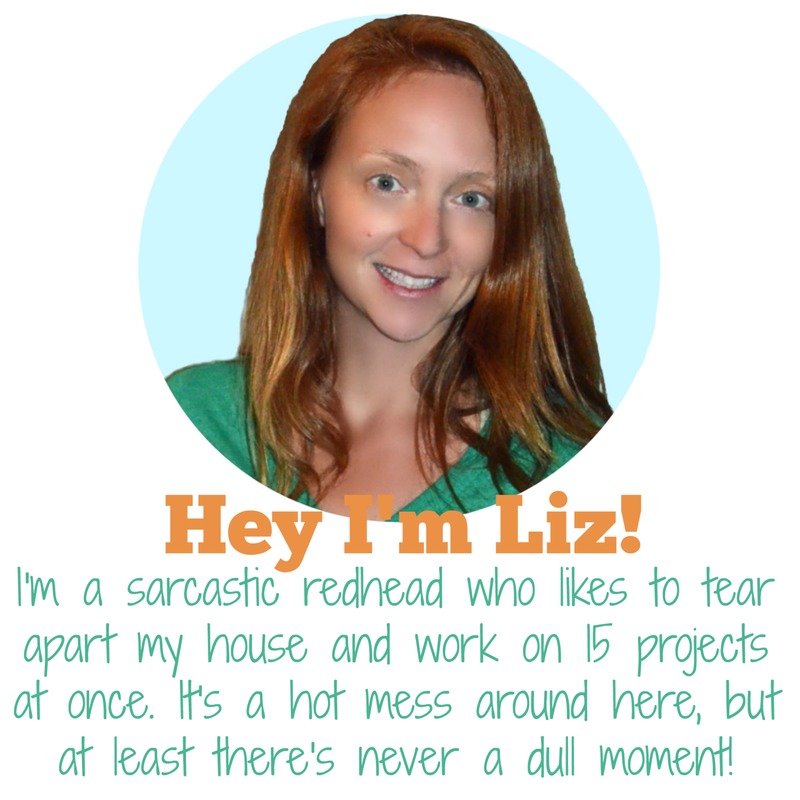 I was enjoying reading your blog until I came to the point where I realized I would not see how your shower turned out. I hope you can post some final pictures. Well Jay… my husband is still waiting to see how the shower turned out too. I never finished it. This spring I swear.